DUBAI’S hope to overtake UK’s capital London as the most popular tourist destination in the world by 2020 is a very exciting prospect indeed. However, it means that the coming six years will present a tremendous challenge for the architectural, interior design and construction industry. The pre-2008 building boom transformed the city not only into one of the fastest growing urban developments, but also shaped a striking skyline. Now that Dubai has matured through the post-crisis years, the next step has to be focusing on quality and not only on quantity. Aesthetics, functionality and sustainability should be the combination that drives developers and architects in Dubai to lead by example not just in the region, but the rest of the world. A big emphasis is on the development of mid-range hospitality projects to cater for the growing demand for three- and four-star hotels in the city. In May 2014, the number of applications in this sector increased to more than 150 which in turn, means that there will be 25,000 additional keys out of the 35,000 target added to the city’s portfolio. Currently, the number of hotel keys is hovering around 80,000; this figure is expected to double by the Expo 2020 opening. The development market had slowed down immensely after the economic downturn, but since Dubai’s successful bid to host the Expo, one mega project after another is being launched and approved. For all hotels, location is the key. Regardless of the star rating, people will always compare hotel offerings by price and proximity to their favoured parts of the city. Dubai attracts a multitude of travellers and the intrigue of tourists worldwide has played a vital role in the city’s success story. Regardless of the purpose of the trip, the city offers a wide variety of lodging for different budgets, from ultra-luxury to basic accommodation. Finding a room during peak season or during The Big 5 exhibition week can be a challenge as certain types of hotel rooms are rarely available. The occupancy rate is still remarkable on a global scale, and shows the attractiveness of the city as both a business and leisure destination. Dubai offers great opportunity to fill the gaps in the city’s portfolio towards its ambitions of becoming the world’s Number One destination. The emphasis should be on developing beachfront hotels that are no longer only five-star properties. Deira Island is one of the developments by Nakheel that could help to enhance the city’s offering and cater for lower income families that want to spend their holidays in Dubai but find it unaffordable. Furthermore, there is a big demand for mid-range business hotels in all of the city hotspots, along Sheikh Zayed Road, Downtown and Dubai Marina. New trends in hotel interiors tend to focus on a ‘home away from home’ feel, which seems to be appealing to a lot of travellers these days. For instance, the Shangri-La Hotel in Nakheel’s Palm Tower on the Palm Jumeirah, which has been designed by RSP Architects, is one such project that delivers this concept. More and more travellers are also attracted to design that incorporates local traditions and culture. Hotel guests are brand conscious but they are mature enough to appreciate a reference to the locality of their accommodation. Creative food and beverage concepts and offerings turn restaurants into destinations and add to the success of the hotel revenue. Furthermore, guests have become more conscious about their ecological footprint which has led to sustainability becoming another deciding factor when booking a hotel room. There is no doubt that it is an incredibly exciting time for the hospitality sector, but with opportunity comes responsibility. In just six years, architects, designers and developers in Dubai will showcase their work to a global audience that will be looking at the city through a microscope. And, hospitality will not only play a crucial role in the lead up to the event and as it is happens, but will also have a long-lasting impact on the way in which the city and Expo 2020 will be remembered. 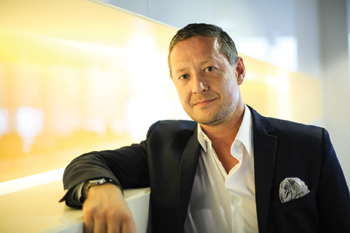 *Ralf Steinhauer is the project director at RSP Architects, one of the largest architectural practices in the world. He has over 10 years of professional experience in Asia, Australia, Middle East and Europe. Steinhauer leads the hospitality division of the Middle East and North Africa (Mena) business focusing on delivering high-quality design.